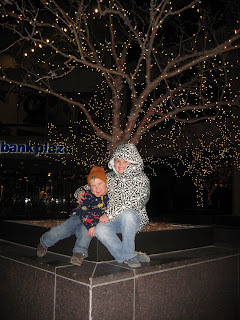 Because we have literally scheduled ourselves into a corner until Christmas, we went to the Holidazzle Parade in downtown Minneapolis tonight (this youtube link is literally the EXACT thing we saw tonight, filmed in 2006). It was a nice night weather-wise, and we didn't go last year, so we felt obligated to take the incredibly-enthusiastic soon-to-be three year old out for some good old fashioned Minnesota kitsch. Included in the regular festivities, to our great surprise, was an appearance by the Minnesota Freedom Band, the likes of which I was unaware existed in this universe. What is this, you ask? Well, it's the all GLBTA marching band!!! But the night started off on a bit of a wrong foot. BioMom and I consciously left the car sans money or any other scrip counterpart that could be used to purchase peddled goods or cocoa or the like. We wondered, at the time, what we'd need it for, and, anyway, we'd head straight home for some hot chocolate after the parade. We were not there for two seconds before Big eyed those strange brightly colored flashlight-like items with what looked like filaments flinging out of the end. Someone else could certainly describe these better than myself, and there is surely a name for what would become our albatross. It started out innocuous enough. Big: Can I have one of those? Me/BioMom: I'm sorry, Honey, we don't have any money. A few moments goes by. Waiting for the parade to start, kids of all ages pour away from the sidewalks into the street. The curbs cannot contain the people on this not-yet-below-zero Minnesota night. The skyways are filled with onlookers watching from above. Every single one of them had one of these glow-y goodness doo-jobs. They filled the streets like cell phones at a concert. Like green at a Packer's game. It was pure torture. Check out his face in this picture. He is FURIOUS! He had actually brought his own flashlight but this was clearly analogous to carrying a boombox on a college campus in 2008. Big: But I WAAAAAAAAAANT one. Big: Where's the MONEY???? I WANT one. Can I have one? I want one of those. Please? I want one. Can I have one? Where's the money? Please? I really REALLY want one of those!! Check and see if you have money. Please? I want one. Can I have one? Minutes go by in relative peace and calculating envy. Eight: Can we get some cocoa? The lady peddling the flashlight thingys goes up and down the street. Across the street three kids are playing Star Wars with their whatchamagigs. The peddler gal walks in front of us, her box aglow with her goods for sale. His tone starts over: Can I get one of those please? We continue our no-cash mantra. Big moves out into the street and I really have no idea where he'll go with this. Neither of our kids expect to get stuff at places. We just don't do that. I'll refuse a twenty-five-cent gumball with the explanation that we're saving for college so this behavior was unusual. Of course, ALL behavior, as we approach this third birthday seems unusual, so I get up with him. In retrospect, I should have noticed that he had surveyed his prey. Kids on right: too big. Kids on left: in a pack. Kid next to him: a baby. He moves toward a nearly-two year old in appearance (that is to say, slightly smaller), standing with his parents behind the parade barrier. Thank god for the barrier, I thought. Big crowded in. In my little embarrassed shuffle,I moved in a little closer to him saying, a little too loudly something about giving people space, reminding him that about that personal bubble he always wants [Eight] to respect? Nervous laugh. Glance up at the parents to see if they are in on the joke. They are not. They look at me like can't you control that kid of yours? Look at our perfect little one, happily waiting for the parade to begin. Not begging. Happily holding his little filament light, a contented smile reflected in its colorful glean. Me: I'm sorry, Honey, that's his. Big turns, winds up and kicks me in the shin. It feels a little like that Bugs Bunny episode where they run into the giant and try to attack him and trip him. It is hard not to giggle just a little bit at his emotions over this light. I wish I could laugh off Eight's anxieties and lashings-out as easily. Her issues feel so much more intense and complicated at the time. I thought to myself, what in the hell am I supposed to do now? 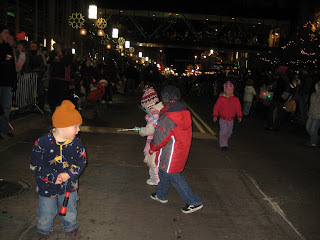 The entire city here, gathered to watch this parade just saw my kid begging for a flashlight and then haul out and kick me... AGAIN! I started channeling Alfie Kohn to ward of my own father brewing up through my blood. Respect the situation he's in, I reminded myself. You can't control him, I reminded myself. I don't want a robot kid that just follows my orders, I reminded myself. He needs to learn INtrinsic behavioral patterns, I reminded myself. Any EXtrinsic rewards or behaviors are short-lived. Blah blah blah. He gets REAL close, face touching the barrier, tries to act interested in the barrier itself, somehow, and, suddenly grabs it from the kids and lets fly, running back toward Eight and BioMom. I look back and BioMom is peeing her pants laughing. I just smiled and pretended to be the nanny. Maybe I should have pretended to be IN the parade and gone ahead and caught up with the Freedom Band.